But wait! That’s not all! There are actually more MOTHER/EarthBound performances to enjoy – you can find them all here! These are some beautiful musical arrangements, perfect for riding out the rest of the workday. I also wanted to say thanks for continuing to update the site. I know we’ve come a long way since the days of the petitions, and that this is more or less a “dead” series with no more goals to work for. Given all that, I still enjoy logging onto the site and seeing a new post. So thanks again. Why does Japan get all the good stuff? Well, at least we have the Zelda Symphony Orchestra here in the states. Also, to piggyback off of Marc’s comment, I also really appreciate this site continuing to be updated. Thanks for everything. I’ll join in on the commentators above me. It’s cool seeing the site be updated, despite the overall lack of major goals the EarthBound community has. I’m waiting to see what Project Chimera has in store, and I’m sure a lot of us are still waiting on that slick EB0 in EarthBound hack from ages ago. The only thing left for us is to see if Mother 3 does receive an official release (which I don’t think will happen, due to the neat repro carts available, and the general homebrew scene). Is it just me, or has anyone else noticed Fangamer’s been drifting away from its original inspirations (Chrono Trigger, EarthBound, Mario RPG and others). Not that it’s bad or anything. I noticed there’s less Chrono Trigger merch than before. There’s plenty of EarthBound items still. Maybe it’s all in my head. Honestly i was expecting someone to walk up in a fancy suit and in the middle as the orchestra and have a mic then say “I miss you” during smiles and tears. @idontlikenames: I can only speak for myself. I’ve been an EarthBound fan since 2010, and at the point in time it seemed like there was always something new here on EBC. From silly posts about Mr. Saturn snowmen to new Fangamer updates and merchandise updates for anything noteworthy on auctions sites, there was always something shaking. EarthBound was still considered an “underground” SNES game with its “cultish fandom”, trying to get it rereleased despite the availability of homebrew carts and emulators. Fangamer was still relatively new (I still remember buying a PK Yomega when they first went on sale, and I still have a copy of their promo video for it). Now that EarthBound (and EarthBound Beginnings) have been rereleased, and the fandom’s growth seems to have grown exponentially, there isn’t as much noteworthy news. But most of all, despite all of us EarthBounders never forgetting about what fun we had playing the trilogy and exploring the different parts of its fandom, life has moved on. There’s not as many large-scale goals for the fandom (besides having Mother 3 rereleased, and we know what the current likelihood of that is), and the other projects currently going on either lack updates or are just taking awhile. Even Fangamer seems to have moved on, having become a base for indie game merch and moving away from the Nintendo-inspired items. The long periods of time between updates here on EBC are a bit disappointing when you think about how much used to go on. But it’s well worth the wait, like finally pulling a package out of the mail after a long wait. @idontlikenames, very specific example, haha. I’ll echo the sentiments of Chairman of the Bored. I played Earthbound back in… ’95 or ’96. I’ve been around the Earthbound online community since my family got internet back in around 2000. It’s been a long ride, but there’s not many other places to go from here. 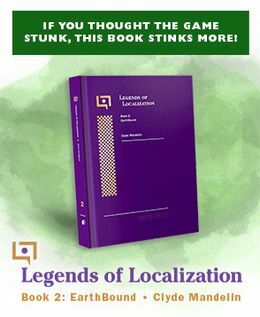 All the goals we had as a community, minus Mother 3 official localization, have been achieved – and the unofficial Mother 3 translation more or less seems to have been tacitly endorsed by Nintendo. I just wanted to express what amounts to about a decade and a half of gratitude. Sorry, I didn’t mean to come across as that mean. @idontlikenames I didn’t think you came off as mean. And I’m sure it’ll get better as time goes on. Thanks guys, I’m glad you still enjoy the site even though it’s slowed down so much. Now that I think about it, next year is the 10th anniversary of the site! Although if you count the stuff I did before it, this is closer to its 10th anniversary. All this is to say that updates will be slow, but I think the site will still keep going for a while longer.